Sergent Garcia's 'Una y Otra Vez' receives a Latin GRAMMY nomination for "Best Tropical Fusion Album"
Sergent Garcia, a pioneering figure in the Latin Alternative and European mestizo music scenes, released the critically-acclaimed 'Una y Otra Vez' on Cumbancha in the Spring of 2011. His unique fusion of salsa, reggae, ska, electrotropical and dancehall with a punk attitude has won him fans across the globe and has now earned him a nomination at the XIII Annual Latin GRAMMY Awards for "Best Tropical Fusion Album." To celebrate, Cumbancha have decided to offer a special discount on 'Una y Otra Vez'. Between now and November 15, 2012 (the day of the Latin GRAMMY Award Ceremony) Una y Otra Vez will be available for 25% off the normal price by using the special discount code of GRAMMY during check out at the Cumbancha Store. That means you can get the physical CD for around $12.75 + shipping or the Digital Download for only $7.50! 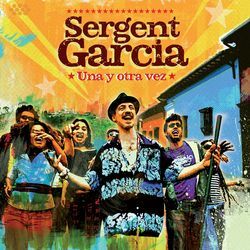 Sergent Garcia will be launching new music videos and remixes shortly as well as a 2013 tour. "Fans of Manu Chao will find Sergent Garcia immediately recognizable: insistently catchy reggae and salsa rhythms, sing-song rap, horn riffs propelling the whole mix".